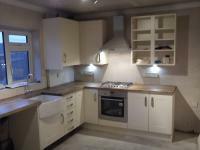 New kitchens, bespoke designs, refurbished or simply altered to accomodate new appliances. Anything from a single double socket to a full rewire. Mutli gang switches which can be engraved. Full office refits using dado trunking. Complete installation of office and warehouse lighting. Conference room solutions with power in the middle of the room, to prevent tripping up on cables across the floor. Emergency light installations, complying with fire regulations.